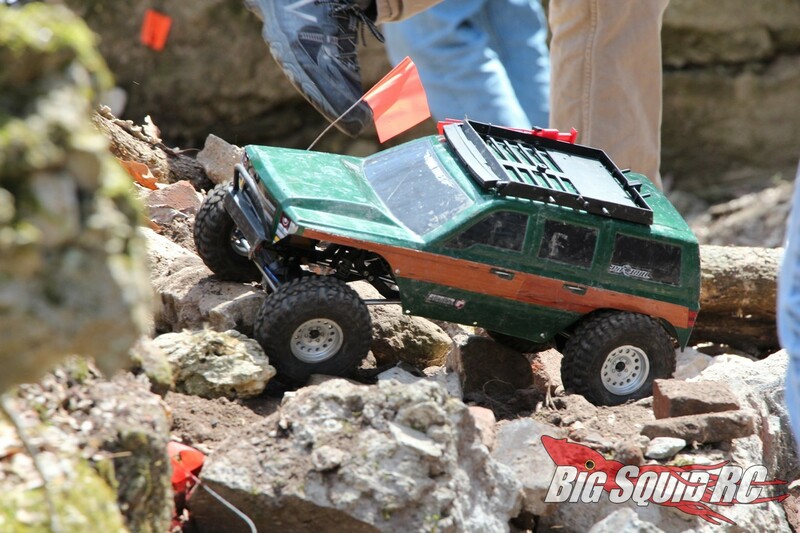 Everybody’s Scalin’ – Flex Appeal « Big Squid RC – RC Car and Truck News, Reviews, Videos, and More! One of the biggest mistakes that a noob can make when first getting into crawling is thinking that suspension flex is the name of the game. It’s not. I mean, of course you need to have SOME articulation, but having 5″ shocks and the ability to rest a front tire comfortably on a Coke can while the rear sits on the ground does nothing for actual real world performance. Actually, check that- in many cases, it actively hurts performance. Chassis balance and center-of-gravity are REALLY what you want to focus on when setting up a rig. You want your weight as low as possible with a decent front bias. This way you have a rig that wants to stay on terra firma even as the going gets vertical. In most cases you will also want to set up the rear of your truck to be a bit stiffer than the front. You can accomplish this on the cheap by using heavier shock oil or springs. This keeps the rear a tad more planted and lets the front do more of the work, as it’s where most of your weight should be. Again, this helps to make for a more stable vehicle in crawling conditions. Now all of this isn’t to say you shouldn’t worry about upgrading your shocks from RTR stockers- you run with a quality single or dual rate setup like the new Pro-Line Pro Spec Scaler Shocks, you’ll REALLY have a smooth riding rig – you just usually don’t need a ton of extra travel. Are there cases where more flex is better? Yes, for sure. Some vehicles, particularly of the ultra-scale variety, have stiff suspensions with not much travel. In that case, yeah, some longer shocks probably are what the doctor ordered. Just don’t get carried away. Remember – it’s not about having the most flex, it’s about having a smooth-acting suspension with proper spring rates. For those of you who are already aware of this, my apologies. However, I figure that a PSA was needed for all the noobs out there! I don’t mean to ruin “Flex Fridays” on your favorite crawler pages, I just want you to be a bit more informed.